You haven’t had your morning coffee yet. It’s the 1st of July. Oh no it's the 1st of July! Phase 2 of your project is kicking off on the 1st of July, but you haven’t even finished Phase 1! You forgot to get your manager to approve the budget for Phase 2, the clients haven’t even signed off on Project 1 and you need to brief your vendors by the end of the week. There isn’t enough time to get everything done. Sounds like you could use some PROJECT MANAGEMENT. Without careful project planning, we often get caught up with our daily work and lose sight of our overall progress. In order to avoid missing deadlines and disappointing stakeholders, take some time to apply the project management method Lens10 practices. We’ve shared our project management framework we use for our digital analytics projects, however it can be applied to any project that you are managing to keep you afloat when you’re drowning in deadlines. Before we dive into our tips for project management, let’s review the steps for managing a project. Initiating: summarise the project requirements, for example, using the Request For Proposal (RFP) or preparing for the orientation meeting, in order to form the right team and skill set for this project. When you do this, think about what the main objective of this project is and how that impacts the overall business. You can then engage the right stakeholders and align the requirements and expectations to them, allowing you to take action to secure the right resource to accomplish the goals within the time frames of the project. Use your client or company’s internal project management tool (e.g. Jira, Trello, etc), so your team is already familiar with the process. Share the rough image of the final outcomes, which are ideally measurable and visual, so your team can understand the journey to get there. For instance, when implementing digital analytics on a website, along with developing the solution design try creating a dashboard where you can see the progress of the tracking during implementation. This helps when you suddenly need to share the project status, which happens more frequently that you expect! 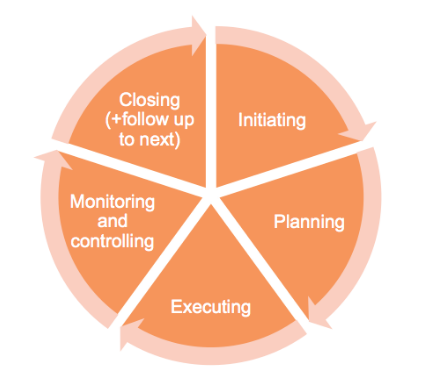 Executing: run and manage the project. Make sure the deliverables are meeting their requirements, are within budget and on time. Monitoring and controlling: manage the project and add support as needed. A project that runs itself, much like a Perpetual Motion Machine, does not exist. The project manager often needs to “tune in” to monitor, troubleshoot problems, and liaise with stakeholders, ensuring the promised Statement of Work is delivered on time using only the allocated resources. Let your stakeholders know in advance if more resources or time are needed. The earlier you bring that up, the easier it is for the stakeholders to make adjustments. Closing and following up: close the project. Follow up with your stakeholders and see if they need any further assistance. The end of a project can be an opportunity to secure more work from a satisfied client. Throughout these 5 steps, initiating and planning are often the most critical steps to ensure your project will be carried out successfully. On the other hand, when the project fails, it’s probably because one or both of these steps were not managed well. Why? Most projects fail because the project objective or/and requirements were not consistently understood across stakeholders. Therefore it’s less likely that managers will be ‘tuned in’ to a project derailing. So how can you avoid such failure? Here are three tips learnt the hard way so you don’t have to. Once the objective is confirmed at the initiating phase, break down each project task into as much detail as possible at the planning phase. The project task list should be comprehensive and specific. For example, if you are developing a solution design, make sure there are elements that specify each solution, such as images and/or tracking codes. This is the “Work Breakdown Structure” referred to by project management professionals. Now you can oversee the list of tasks and its required resources and time to complete them. This lets you easily identify the potential risk spots beforehand and you can up your monitoring of the project at these pressure points. Other project drivers review your schedule. Especially for the technical items that will require a developer's time. Ensure there is a buffer included before delivery of each task to allow for last minute adjustments (approximately 15%-25% buffer, depending on complexity of each item). This is critical to manage the quality of each delivery without causing a resource bottleneck. This is the most fundamental yet critical element to determine success of your project. From Step 1 initiating to Step 5 closing, you need to manage the diverse range of stakeholders who are involved with the project. All projects require input from other people including those that fund and are impacted by the project. 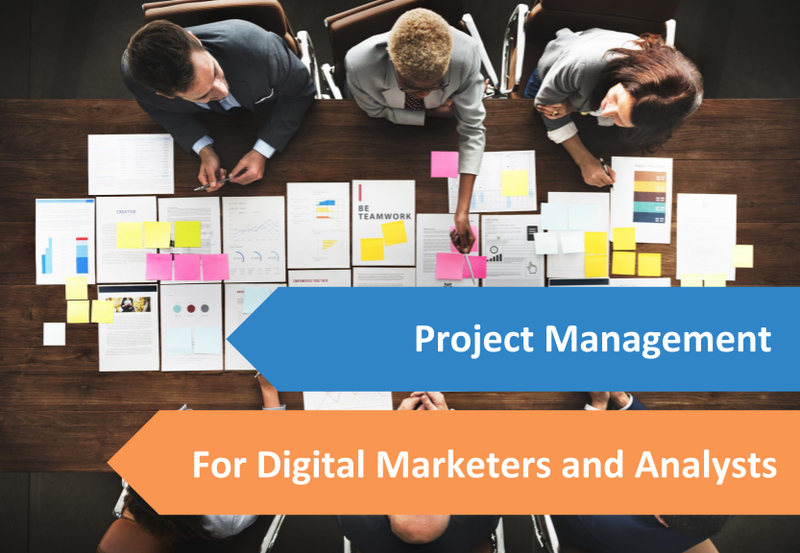 For instance, if you are driving the project for the digital marketing team, it may also impact your internal resources such as Marketing, IT, Compliance, and your vendor. Most project management failures are due to a lack of alignment in stakeholder expectations. Ensure the project requirements such as objective, budget, delivery items, status, problems, and KPI’s are frequently shared across stakeholders and documented. This will be essential for reference as you progress deeper into a project and need to refocus your team on the original scope and outcomes. When the project manager is in control, the project is in control. We hope this is helpful for your future project management endeavours and future blood pressure results!